Small problems need only small answers. But when we face great problems, God has an opportunity to exercise his great power. As the Hebrew’s troubles grew steadily worse, God planned to intervene with his mighty power and perform great miracles to deliver them. How big are your problems? Big problems put you in a perfect position to watch God give big answers. 2 God also spoke to Moses and said to him: “I am the LORD. 3 I appeared to Abraham, Isaac, and Jacob as God Almighty, but by my name ‘The LORD’ I did not make myself known to them. 6 Say therefore to the Israelites, ‘I am the LORD, and I will free you from the burdens of the Egyptians and deliver you from slavery to them. I will redeem you with an outstretched arm and with mighty acts of judgment. 7 I will take you as my people, and I will be your God. You shall know that I am the LORD your God, who has freed you from the burdens of the Egyptians. Let’s Pray: Lord, through this chapter we have come to know that we need to focus on you rather on the results to be achieved, see beyond temporary setbacks and reversals. Also, that only those with persistent faith can obey when the task seems impossible. Almighty God we pray for our salvation and your mercy in our lives and the lives of all the people who seek you. Amen. 4 I also established my covenant with them, to give them the land of Canaan, the land in which they resided as aliens. and I have remembered my covenant. 9 Moses told this to the Israelites; but they would not listen to Moses, because of their broken spirit and their cruel slavery. 14 The following are the heads of their ancestral houses: the sons of Reuben, the firstborn of Israel: Hanoch, Pallu, Hezron, and Carmi; these are the families of Reuben. 15 The sons of Simeon: Jemuel, Jamin, Ohad, Jachin, Zohar, and Shaul, the son of a Canaanite woman; these are the families of Simeon. 16 The following are the names of the sons of Levi according to their genealogies: Gershon, Kohath, and Merari, and the length of Levi’s life was one hundred thirty-seven years. 17 The sons of Gershon: Libni and Shimei, by their families. 18 The sons of Kohath: Amram, Izhar, Hebron, and Uzziel, and the length of Kohath’s life was one hundred thirty-three years. 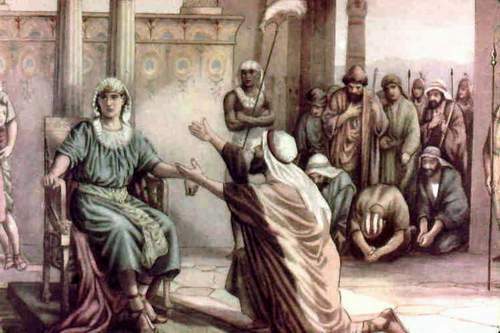 20 Amram married Jochebed his father’s sister and she bore him Aaron and Moses, and the length of Amram’s life was one hundred thirty-seven years. 21 The sons of Izhar: Korah, Nepheg, and Zichri. 22 The sons of Uzziel: Mishael, Elzaphan, and Sithri. 23 Aaron married Elisheba, daughter of Amminadab and sister of Nahshon, and she bore him Nadab, Abihu, Eleazar, and Ithamar. 24 The sons of Korah: Assir, Elkanah, and Abiasaph; these are the families of the Korahites. 25 Aaron’s son Eleazar married one of the daughters of Putiel, and she bore him Phinehas. These are the heads of the ancestral houses of the Levites by their families. 27 It was they who spoke to Pharaoh king of Egypt to bring the Israelites out of Egypt, the same Moses and Aaron. God had blessed Esau’s household and Esau’s sons were too blessed. God had blessed Esau too with riches as Jacob. Magdiel, and Iram; these are the clans of Edom (that is, Esau, the father of Edom), according to their settlements in the land that they held. Let’s Pray: God blesses those who follow and obey him. We all falter many a times in our lives. We get angry and frustrated easily. We look down upon people and even indulge in gossiping. Our Christian life demands absolute submission to God. Our riches does not lie in this transient world but we have been promised eternity in heaven. Let us remove all the pretences, sinful living and materialistic pursuits from our daily lives. Now is the time to submit ourselves to God. Make prayers part of our daily lives and include God in all our pursuits. May the God almighty bless us all. Amen. 1 These are the descendants of Esau (that is, Edom). 3 and Basemath, Ishmael’s daughter, sister of Nebaioth. 5 and Oholibamah bore Jeush, Jalam, and Korah. These are the sons of Esau who were born to him in the land of Canaan. 7 For their possessions were too great for them to live together; the land where they were staying could not support them because of their livestock. 8 So Esau settled in the hill country of Seir; Esau is Edom. 9 These are the descendants of Esau, ancestor of the Edomites, in the hill country of Seir. 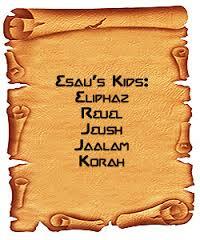 10 These are the names of Esau’s sons: Eliphaz son of Adah the wife of Esau; Reuel, the son of Esau’s wife Basemath. 12 (Timna was a concubine of Eliphaz, Esau’s son; she bore Amalek to Eliphaz.) These were the sons of Adah, Esau’s wife. 13 These were the sons of Reuel: Nahath, Zerah, Shammah, and Mizzah. These were the sons of Esau’s wife, Basemath. 14 These were the sons of Esau’s wife Oholibamah, daughter of Anah son of Zibeon: she bore to Esau Jeush, Jalam, and Korah. 16 Korah, Gatam, and Amalek; these are the clans of Eliphaz in the land of Edom; they are the sons of Adah. 17 These are the sons of Esau’s son Reuel: the clans Nahath, Zerah, Shammah, and Mizzah; these are the clans of Reuel in the land of Edom; they are the sons of Esau’s wife Basemath. 18 These are the sons of Esau’s wife Oholibamah: the clans Jeush, Jalam, and Korah; these are the clans born of Esau’s wife Oholibamah, the daughter of Anah. 19 These are the sons of Esau (that is, Edom), and these are their clans. 21 Dishon, Ezer, and Dishan; these are the clans of the Horites, the sons of Seir in the land of Edom. 22 The sons of Lotan were Hori and Heman; and Lotan’s sister was Timna. 23 These are the sons of Shobal: Alvan, Manahath, Ebal, Shepho, and Onam. 24 These are the sons of Zibeon: Aiah and Anah; he is the Anah who found the springs in the wilderness, as he pastured the donkeys of his father Zibeon. 25 These are the children of Anah: Dishon and Oholibamah daughter of Anah. 26 These are the sons of Dishon: Hemdan, Eshban, Ithran, and Cheran. 27 These are the sons of Ezer: Bilhan, Zaavan, and Akan. 30 Dishon, Ezer, and Dishan; these are the clans of the Horites, clan by clan in the land of Seir. 31 These are the kings who reigned in the land of Edom, before any king reigned over the Israelites. 32 Bela son of Beor reigned in Edom, the name of his city being Dinhabah. 33 Bela died, and Jobab son of Zerah of Bozrah succeeded him as king. 34 Jobab died, and Husham of the land of the Temanites succeeded him as king. 35 Husham died, and Hadad son of Bedad, who defeated Midian in the country of Moab, succeeded him as king, the name of his city being Avith. 36 Hadad died, and Samlah of Masrekah succeeded him as king. 37 Samlah died, and Shaul of Rehoboth on the Euphrates succeeded him as king. 38 Shaul died, and Baal-hanan son of Achbor succeeded him as king. 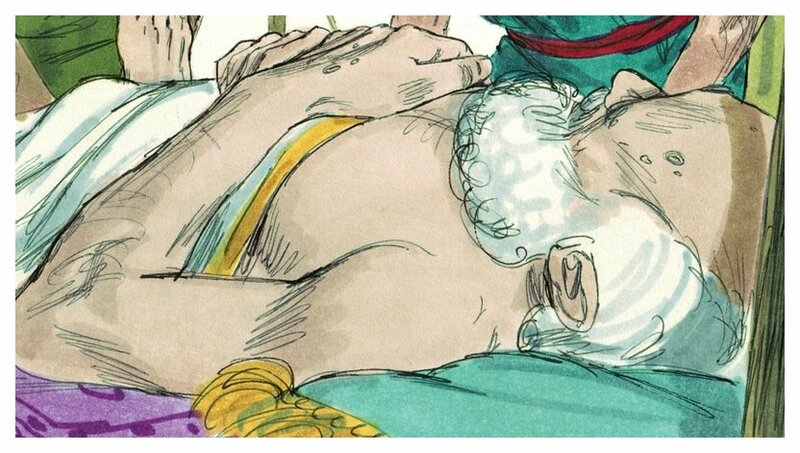 39 Baalhanan son of Achbor died, and Hadar succeeded him as king, the name of his city being Pau; his wife’s name was Mehetabel, the daughter of Matred, daughter of Me-zahab. 43 Magdiel, and Iram; these are the clans of Edom (that is, Esau, the father of Edom), according to their settlements in the land that they held. Who could believe that Abraham would have a son at 100 years of age- and live to raise him to adulthood? But doing the impossible is everyday business for God. Our big problems won’t seem so impossible if we let God handle them. Sarah cried out with surprise and joy at the birth of her son after repeated promises, a visit by two angels, and the appearance of Lord himself. Because of her fear, she had forfeited the peace she could have felt in God’s wonderful promise to her. The way to bring peace to a troubled heart is to focus on God’s promises. Trust him to do what he says. 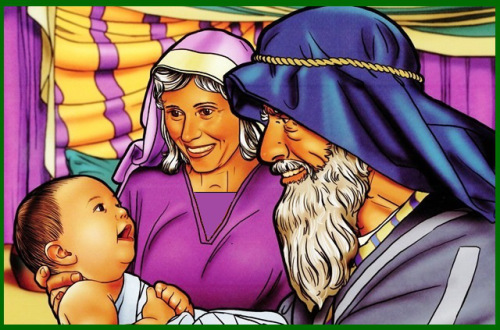 Sarah conceived and bore Abraham a son in his old age, at the time of which God had spoken to him. 8 The child grew, and was weaned; and Abraham made a great feast on the day that Isaac was weaned. 9 But Sarah saw the son of Hagar the Egyptian, whom she had borne to Abraham, playing with her son Isaac. 12 But God said to Abraham, “Do not be distressed because of the boy and because of your slave woman; whatever Sarah says to you, do as she tells you, for it is through Isaac that offspring shall be named for you. 14 So Abraham rose early in the morning, and took bread and a skin of water, and gave it to Hagar, putting it on her shoulder, along with the child, and sent her away. And she departed, and wandered about in the wilderness of Beersheba. 16 Then she went and sat down opposite him a good way off, about the distance of a bowshot; for she said, “Do not let me look on the death of the child.” And as she sat opposite him, she lifted up her voice and wept. 17 And God heard the voice of the boy; and the angel of God called to Hagar from heaven, and said to her, “What troubles you, Hagar? Do not be afraid; for God has heard the voice of the boy where he is. 27 So Abraham took sheep and oxen and gave them to Abimelech, and the two men made a covenant. 28 Abraham set apart seven ewe lambs of the flock. 31 Therefore that place was called Beer-sheba; because there both of them swore an oath. 32 When they had made a covenant at Beersheba, Abimelech, with Phicol the commander of his army, left and returned to the land of the Philistines. 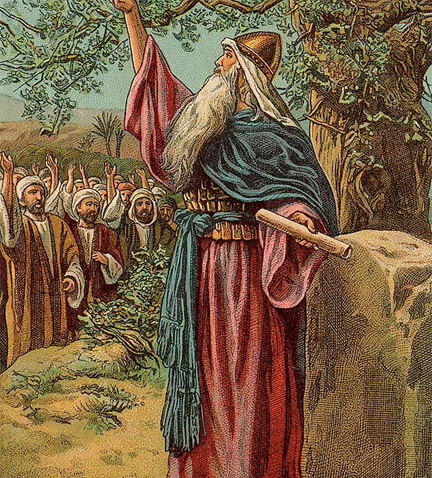 33 Abraham planted a tamarisk tree in Beer-sheba, and called there on the name of the LORD, the Everlasting God. 34 And Abraham resided as an alien many days in the land of the Philistines.